Venera 9 mission simulation released! Venera 9 (Венера-9, 4V-1 No. 660) USSR unmanned orbiter and a lander mission to Venus. 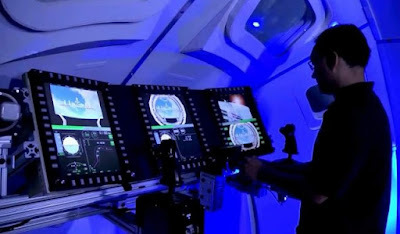 Spacecraft description and implementation in Orbiter space sim. The Venera 9 is implemented as two spacecraft (Orbiter+Lander). The meshes are as accurate as I was able to model them. I tried to follow authentic flight hardware photos as much as possible. Please take into account the fact that Russian hardware on display doesn’t have the thermal covers that were actually used for spaceflight and is sometimes painted with different colors for aesthetic purposes. Therefore, my models will look different from some of the Venera 9 replica photos you might see. Texturing could be improved to give a more uniform thermal cloth cover to the orbiter bus, and other small mesh bugs are present. Nevertheless I think that those small issues don’t detract from the addon usability and can always be corrected at a latter stage. The general addon organization and vessel parameters come straight from the Venera-D addon by kodiak. Masses and fuel were changed to reflect the Venera 9 values but the lander’s aerodynamic parameters are unchanged. The generic Venera orbiter mesh came from the model available for Celestia by Jack Higgins, in turn based on a VRML by Alexander Chernov. All credit goes to them for the base model used. I did a lot of adaptations so that it would represent the Venera 9 configuration. I added new solar panels with the right dimensions and shape and removed some non-existing instruments. Also, the engine bell and RCS jet hardware was added and the dimensions were scaled to match the entry sphere. Launch scenarios require the Proton Launch Vehicle v.1.0 by thorton. The orbiter consisted of a cylinder with two solar panel wings and a high gain parabolic antenna attached to the curved surface. A bell-shaped unit holding propulsion systems was attached to the bottom of the cylinder, and mounted on top was a 2.4 meter sphere which held the lander. It’s implemented in Orbiter as a spacecraft3 vessel with the lander’s entry sphere as a payload and RCS thruster exhaust visible. The “J” key will jettison the lander’s sphere if still attached. The lander spacecraft separates from the orbiter. A system of circulating fluid was used to distribute the heat load. This system, plus pre-cooling prior to entry, permitted operation of the spacecraft for 53 minutes after landing. During descent, heat dissipation and deceleration were accomplished sequentially by protective hemispheric shells, three parachutes, a disc-shaped drag brake, and a compressible, metal, doughnut-shaped landing cushion. It’s implemented in Orbiter as a series of spacecraft3 vessels and payloads, starting with the entry sphere that is released from the orbiter and ending with the lander itself. As in reality, no fuel or any kind of control is possible. The entry sphere simply follows the path it was released on. Use the “j” key to control the deployment of parachutes and release of the protective sphere. I’m providing 5 scenarios that cover all of the mission stages. Descriptions folow the actual mission events and not necessarilly the values you will see in Orbiter. Nevertheless, you can try to follow them as guidelines. During July to September there were two course corrections. The first (11.93 m/s dv) placed the trajectory of the probe within 1,600 kilometres from the surface of Venus, and the second (13.44 m/s dv) refined the landing region and time of the entry for the lander. The Venera-9 lander hit the surface of the planet with the speed of around seven meters per second at 0513 UT on October 22, 1975. It was the daylight local time on the side of the planet not visible from Earth. The landing site was determined to be 32 degrees north latitude and 291 degrees longitude in Beta Regio. During next 53 minutes, the lander streamed data to the orbiter, which in turn relayed it back to Earth. The transmission of priceless imagery started some two minutes after the landing and continued until the end of communications. 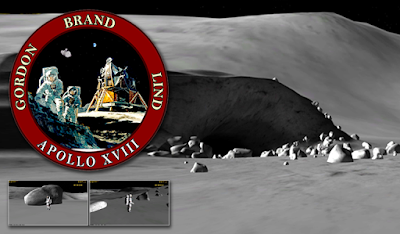 The lander ended up under a 30-degree angle and its cameras could only see as far as few dozen meters. Soviet scientists suggested that the material at the site represented remnants of rocks fractured as a result of the internal shifts and faults in the planet's crust. The tectonic process possibly caused a mass of debris to slide along the slope. Another surprise was a relatively good visibility -landscape features could be discerned as far as 100 meters from the lander --despite enormous density of the surrounding haze. One Soviet scientist apparently went far enough to compare lighting conditions on Venus with a "cloudy day in Moscow." October 26 / December 25 -The orbiter gathered further data.